Nadia and Nancy Koch's porcelain birds fly from their studio in France to your finger. A little birdy told us playful rings were your thing. So when we met sisters Nadia and Nancy Koch—the queens of statement pieces—we knew we had to share their work with you. 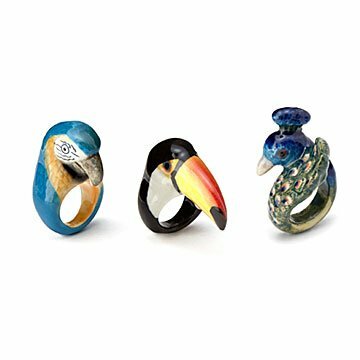 They handcraft these over-sized avian rings from porcelain, giving each a colorful personality. Great for cocktail parties and events, they also make everyday outfits take flight. Choose from a bright red parrot, orange-beaked toucan, or turquoise peacock. Handmade in Toulouse, France. How do sisters Nadia and Nancy Koch find inspiration? It isn't too difficult, since they live and work in Toulouse, a beautiful, bustling city in the south of France. Their main muse isn't the architecture or delicious French eats, though, it’s colorful birds and rainforest animals. The sisters bring their favorite creatures to life with their jewelry and clothing. It's all handmade, usually from hand-sculpted porcelain or high-quality cloth. They hope you'll find a piece that's timeless and rare in their "cute, wild, and fascinating" collection.